Pregnant women in the U.S. receive more healthcare interventions today than any time in recent history. Foremost among recommendations strongly promoted in prenatal care visits are the Tdap and Flu vaccines, despite the fact that neither vaccine is demonstrated to be either safe or significantly beneficial for pregnant women and their babies. Today’s post, second in a two-part series, will focus on the influenza (flu) vaccine. The Advisory Committee on Immunization Practices (ACIP) began recommending the flu vaccine in 1997 to all U.S. pregnant women in their second and third trimesters, as well as specific populations of pregnant women at high risk for infections. In 2004, this recommendation was broadened to include all pregnant women and women who may become pregnant, regardless of health history or contraindications. However, available data suggests that benefits of flu vaccination are negligible, and that vaccination may present greater risks to pregnant women than contracting the flu. Does the Flu Present Significant Risk for Pregnant Women? Influenza is a highly infectious viral illness which can cause serious upper respiratory complications. Naturally lowered immunity during pregnancy, as well as limited breathing capacity due to the position of the growing fetus, can increase the risk of complications for pregnant women. These factors may drive healthcare providers to be particularly zealous in encouraging their pregnant patients to consent to flu vaccination, despite the lack of demonstrated efficacy or safety. While upper respiratory infection may be concerning for pregnant women, the perceived risk of contracting the flu seems to be greatly exaggerated, in part because the CDC reports combined flu and pneumonia deaths as a single statistic. For instance, the 2013 reported combined mortality figure for “Influenza and Pneumonia” in the entire U.S. population was 56,979. However, a closer look at the supporting data published by the National Center for Health Statistics (NCHS) reveals that the total number of 2013 deaths from influenza alone was 3,697 or 6% of the combined total. Of those 3,697 deaths from the flu, only 122 cases (3% of influenza deaths) occurred among women age 18-44. This statistical insignificance begs the question of why the combined statistic is published, since pregnant women are at extremely low risk of death from influenza. Only 0.2% of deaths reported occurred among women within the childbearing age group, so the risk of mortality from the flu in this group is 0.00021%. And the relative risk is further obscured by the fact that most “flu-like” illnesses with symptoms of fever, body aches, and coughing are relatively unlikely to be caused by influenza virus. One 2006 report cited findings that among pregnant subjects studied, only 11% reporting flu-like illness showed serological evidence of the flu, while none showed detectable influenza A-specific immunoglobulin. Close examination of statistics reveals that even if we assume the vaccine is effective in preventing the flu, vaccination of pregnant women provides no statistically significant reduction in U.S. flu deaths. Does the Flu Vaccine Prevent Flu Infection or Reduce Severity? Even the CDC’s most optimistic assessment of flu vaccine efficacy reports that the 2014-15 flu vaccine was only 18% effective in preventing A strains and 45% effective in B strains. But even that low level of efficacy may be inflated, since most efficacy studies conducted by the CDC and vaccine manufacturers measure only the serum antibody levels immediately following vaccination, without long-term follow-up to determine whether the subjects actually contract the disease. In fact, there is long-standing speculation about whether or not the presence of serum antibodies stimulated by vaccination is directly protective against illness. Dr. James Cherry first examined this question regarding pertussis, coining the term “original antigenic sin” to describe the way the vaccine seemed to misprogram the recipient’s subsequent immune response to future pertussis exposure. This conundrum has also been observed with tetanus vaccination, as discussed in Part I of this series. Growing evidence suggests that flu vaccine failure may have similar origins. The largest epidemiological study conducted to date on flu vaccination of pregnant women found that among approximately 50,000 subjects studied over a 5-year period, the flu vaccine offered no protection: the rates of reported “flu-like illness” were identical in vaccinated versus unvaccinated subjects. A broad Cochrane meta-analysis found similarly abysmal evidence of efficacy in the general population. Yet another 2006 study found that the flu vaccine conferred no protection to newborns of subjects vaccinated during pregnancy. A recent meta-analysis also seems to indicate that yearly flu vaccination may actually increase the risk of contracting certain strains. Smith named the problem “negative interference” in this 1999 study, which outlined the process whereby antibodies stimulated by a current year’s vaccine may interfere with the subsequent immune response to emergent strains in the following year. That phenomenon may contribute to the findings of this study, in which recipients of the 2009 flu vaccine were at greater risk of contracting pandemic H1N1 illness in 2010. Another study found that recipients of the H1N1 vaccine were at greater risk of H1N1 infection. And finally, while this 2014 study demonstrated that flu vaccination did not reduce severity or symptoms in vaccinated subjects who contracted the flu, another study observed a 4.4-fold increase in risk of non-influenza upper respiratory infections among vaccinated subjects. These findings could be related to the specific effect observed here: annual flu vaccination was found to hamper the production of virus-specific CD8(+) T cell immunity in subjects. Is the Flu Vaccine Safe for Pregnant Women and Their Babies? The CDC emphatically and unequivocally declares that the flu vaccine is safe for pregnant women, citing studies evaluating data collected from the Vaccine Adverse Event Reporting System (VAERS) and the Vaccine Safety Datalink (VSD). As we discussed in Part I, the CDC concedes the limitations of these passive, incomplete and proprietary data sources. Does the larger body of evidence support the assertion that flu vaccination is universally safe? Manufacturers of flu vaccines must include this statement because there is an ever-growing body of evidence indicating relatively high risks associated with the flu vaccine in particular. Most alarmingly, Goldman used regression analysis of VAERS reports in this study of the 2009-2010 flu season to calculate an approximate 4350% increase in fetal losses after the H1N1 vaccination campaign. It’s also useful to note that the flu vaccine accounts for the highest number – an overwhelming 43% – of all claims filed to the National Vaccine Injury Compensation Program (NVICP) between 2006-2015. Several studies demonstrate that flu vaccination increases inflammation in pregnant women, and in particular increases the incidence of C-reactive protein (CRP) which, alarmingly, may correlate with higher risk of gestational diabetes and eclampsia. This observation is especially troubling given recent findings that associate CRP elevation during pregnancy with autism. The 2010 swine flu vaccination campaign in Australia was abruptly suspended in children under 5 after 1 in 110 children experienced febrile convulsions immediately following vaccination. Additionally, the Pandemerix swine flu vaccine was found to cause narcolepsy in Finland and Sweden as well as Ireland, where use of the vaccine was discontinued. Perhaps the most alarming implication of mass vaccination among all pregnant women in the U.S. is that many flu vaccines still contain thimerosal, despite the 2001 Institute of Medicine (IOM) recommendation to immediately remove thimerosal from all vaccines in light of overwhelming evidence of harm associated with mercury. Mercury toxicity in humans is well established and undisputed, particularly in infants and developing fetuses. While proponents of flu vaccination often argue that only “trace” or negligible amounts of mercury are delivered in vaccines preserved with thimerosal, it’s useful to put the amount of mercury in one vaccine dose into perspective. Two parts per billion (2 ppb) of mercury is the EPA allowable limit in drinking water, while allowable concentrations in fish range from 0.028 to 1.816 ppb. A single dose of flu vaccine preserved with thimerosal typically contains 25 mcg of mercury, or 25,000 ppb. Another oft-used argument suggests that the ethylmercury contained in thimerosal is less toxic than methylmercury; however this 2012 study examining thimerosal-derived ethylmercury toxicity in human astrocytes (glial cells of the brain and spinal chord) found that thimerosal exposure caused mitochondrial damage. This 2005 study found that monkeys exposed to ethylmercury via intramuscular injection had higher concentrations of mercury in their brains than those who ingested methylmercury. Further, mercury received via intramuscular injection may be absorbed at a much higher rate than mercury ingested orally, which is excreted primarily through bile and feces. Rodent models have demonstrated changes in opioid receptors, dopamine system impairment, and changes to the frontal cortex following thimerosal exposure. This primate study found that neonatal thimerosal exposure induced delayed acquisition of neonatal reflexes. And overwhelming evidence suggests that vaccines containing thimerosal are associated with neurodevelopmental disorders in children. Another troubling ingredient in flu vaccines, the surfactant polysorbate 80, which crosses the blood-brain barrier, has been associated with oxidative stress – this may also help to explain the increased inflammation observed in pregnant women following flu vaccination. Like the Tdap vaccine discussed in Part I, no compelling evidence confirms that flu vaccination confers significant protection to pregnant women. However, there is significant evidence that thimerosal-preserved flu vaccines in particular could present grave risks to both pregnant mothers and their babies. Among all the interventions pregnant women may be pressured to receive, the flu vaccine is one of the least scientifically supported and most risky recommendations. Pregnant women should be fully aware of their right to decline every drug or intervention, including the flu vaccine. 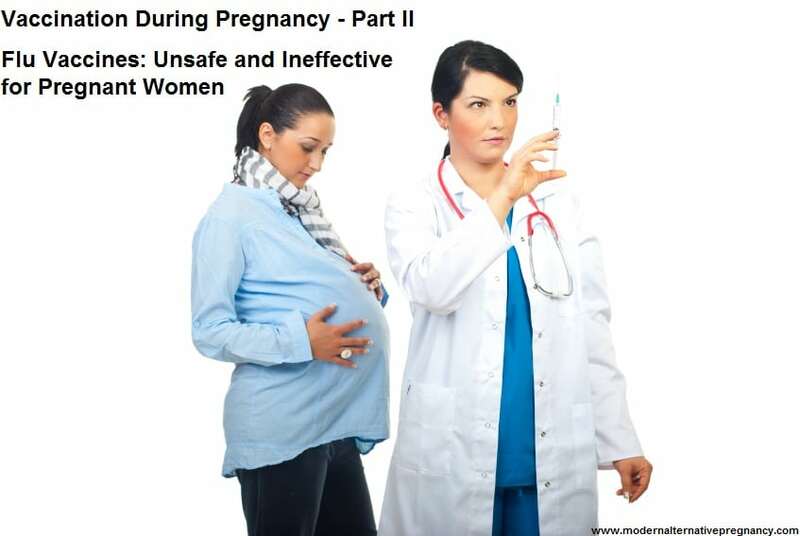 No patient is more vulnerable than a pregnant mother or her unborn baby, and pregnant mothers are cautioned to be very conservative with every other class of drug and intervention. Vaccination, especially when the protection conferred is neither robust nor imperative, should be no exception. What are your thoughts on flu vaccination for pregnant women? In other words, GSK is looking for test subject via the population of pregnant women without going through the necessary protocols for a trial study. I have to get a flu shot for my job (hate it but quitting not an option). We want to try to get pregnant again very soon…how soon after the shot is it safe to try? I will get the preservative free version.